I met Milou about two years ago back in November of 2013. It was early in the relationship but even then I knew we were going to have to deal with a lot of issues. One of the big ones was that Milou’s original batteries had been neglected/damaged to such a degree that when I first turned on the battery switch the batteries began to boil acid out through the vent holes and tried to light themselves on fire… not good. 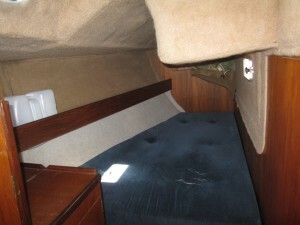 F’s cabin. Yeah, torn fabric. Original evil batteries. Acid. Smoking. The first thing I did after the boat made it to Wisconsin was remove both of the 135 lb group 4D batteries. 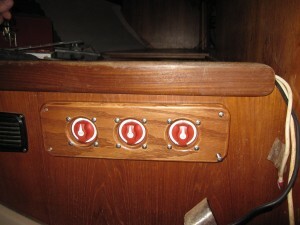 I carried them, wet and slimy with acid, out of the starboard aft cabin up the companionway and up to the side deck. At this point I was so mad I wanted to simply drop them 10 feet to the ground below, but Deb urged restraint and John (marina guy) safely lowered them down with his forklift. It was winter and the boat was three hours away from our home. I thought I would be able to clean up the acid mess and put in some new batteries in one trip. Looking back over my notes, it took four trips. New shelf and temporary batteries. 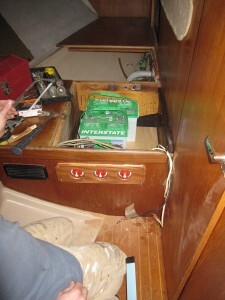 I removed all of the burned, acid-soaked wood, which included the shelf the old batteries were sitting on. I thought I would neutralize the acid with some baking soda, which made a cool angry hissing noise. After neutralizing the acid, I coated all of the exposed, burned wood with epoxy. On trip number three I made the new shelf; then I brought it home and covered it with fiberglass so I could install it on trip four. I was working on this in December, so if I wanted light after 3:30pm I needed to have some sort of battery hooked up. 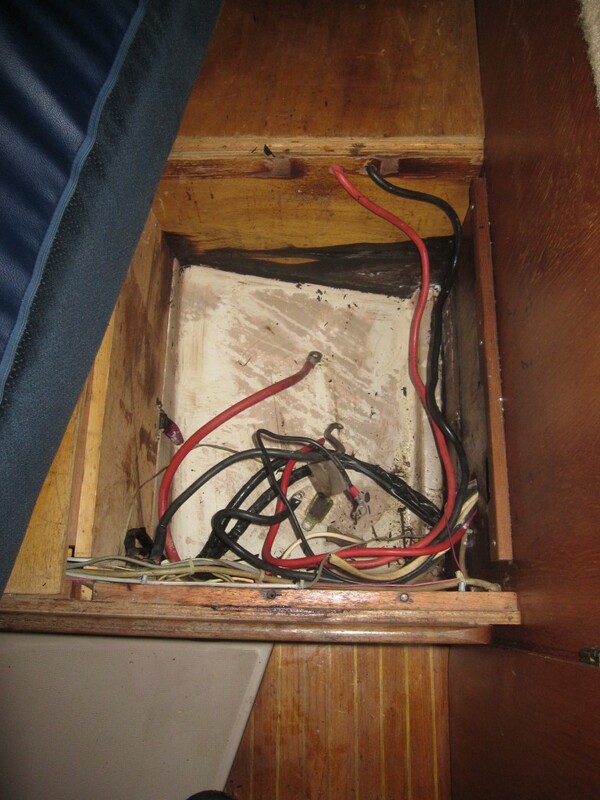 A cruising boat has two different electrical systems, DC (batteries) and AC (extension cord or generator); all of the lights on Milou are DC. I installed two used-but-decent traditional lead acid batteries. We ended up using these batteries for the entire first year on Milou. During my winter boatwork trips, I would schlep a battery home and charge it up, then bring it back to Oconto to use for a weekend. Before I could install new batteries, I had to replace the battery switch and battery cables, as they had all been severely corroded by the spilled acid. The idea is that you select battery 1 to start the motor, drive around, and when you stop you turn the switch to battery 2. That way, if you blast your tunes all afternoon and run down battery 2, simply turn the switch back to 1 so you can start the motor and head home. If battery 1 happens to be low you can combine both batteries by selecting 1+2. I know exactly how this switch works and yet every time I reach for it I have to think about what I am doing–this switch is not at all intuitive. 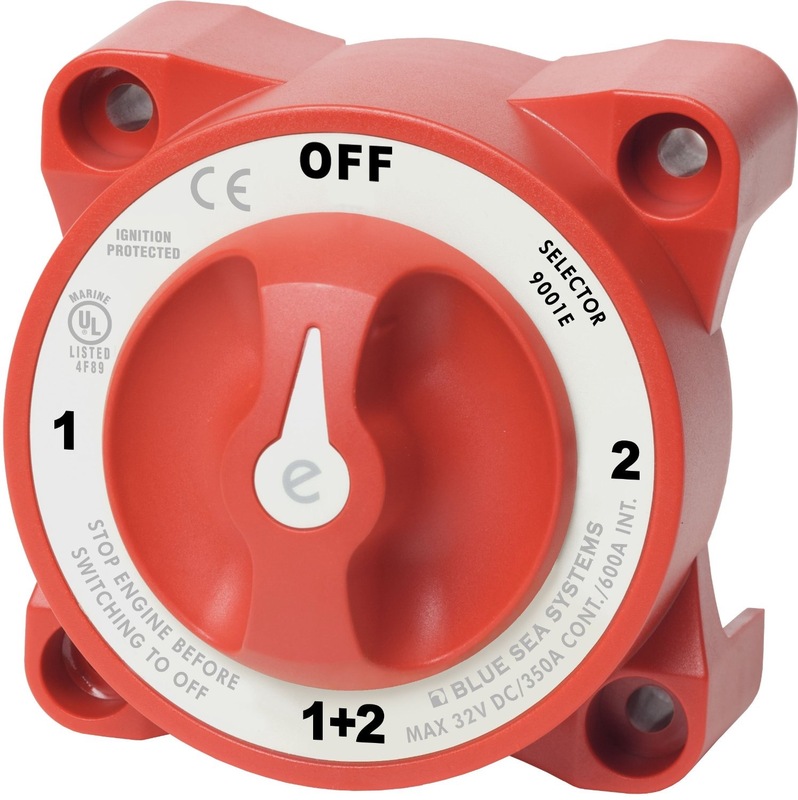 Added to this, if you start the motor on battery 1 and want to switch over to 2 to charge up the house battery, you will destroy the regulator on your alternator. If you turn this switch with the engine running, an expensive important thing breaks. I feel that this is a superior set up: three separate switches. I made this board and mounted three simple on/off switches. One switch for the starting battery, one for the house bank and the one in the middle will act as jumper cables if the starting battery ever goes dead. 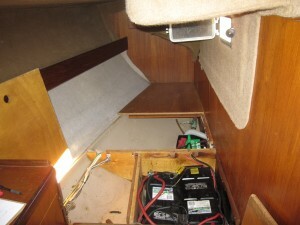 That was it in the beginning: new shelf; new switches; new battery cables; scrounged-up free used lead acid batteries; and a small 20 watt solar panel to keep the batteries topped off while we were away. Next up is a real snoozer; I call it “energy storage” or “battery chemistry”.